A favourite finishing session of mine discovered via Nike Training and the coaching staff of Barcelona. It involves passing and receiving while moving within the penalty box. Encourages players to make quick decisions in a tight spaces to create opportunities to strike at goal. 3-5 players & 2 mannequins/flags to replace a GK if not available. The centre of the penalty box is restricted by 3 cones/mannequins/poles. Player &apos;A&apos; starts about 5yds outside the penalty box and dribbles towards it centrally. Player &apos;B&apos; is around the penalty spot. The mannequins are about 1.5yds inside the goalpost, 5yds apart. Play always starts with Player &apos;A&apos; rolling the ball out of his/her feet and dribbling towards the central area of the penalty box. Switch positions after strike on goal. Player &apos;A&apos; dribbles the ball towards the penalty box. Player &apos;B&apos; quickly decides to move to either side of the central area. 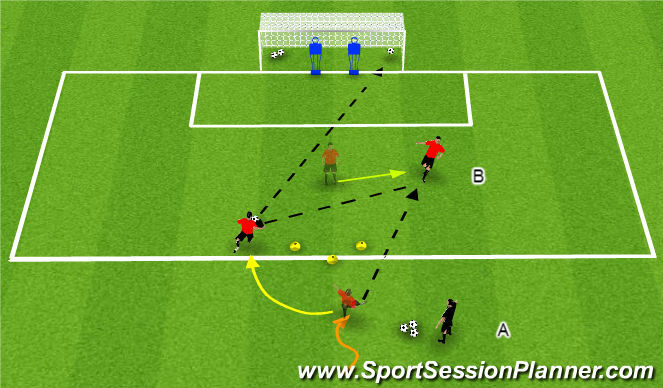 Player &apos;A&apos; recognizes the movement & plays a pass to &apos;B&apos; who plays a wall pass back to &apos;A&apos;&apos; (first time if possible) to finish (within 1 touch if possible) into the target areas. Reading the movement (scan shoulders) for correct decisions, Creating Space (Open Body to receive), Preparing to play 1 touch, Passing into space, Receiving and striking at goal on the run, Accurate Finish (pass the ball into the net inside the box).